You know that awesome feeling a yeshiva boy has when he thinks up something new and original all on his own, a chiddush, or sometimes even a kasha (question), and then the Rebbi tells him he was michaven to a rabbi akiva eiger or maybe even a rishon and it makes him feel only better. Why would a child be so excited that he is repeating the same thing as someone over one thousand years ago? Because, the boy is taking pride in the feeling of having had that same insight that another great person had and moreover it proves to the boy that he grasps the sugya at hand, well enough to be bothered by the same question a great talmudic scholar was millenniums ago. It’s like discovering the world is round all on your own. Listening to Rabbi Weinberger’s shiur made me feel like that boy. Sometimes I write or say things and I think I might be of an unsound mind. I know, I get lots of positive feedback but it bothers me that if what I'm saying makes so much sense to my mind, why aren't others saying it. So today, when I listened to Rabbi Weinberger's shiur, I felt a huge relief. It was as if a great person was telling me I’m not insane. And the way he explained it with Rav Kooks ideas made it even more interesting and insightful. When I listen to the shiur and hear Rabbi Weinberger’s pain in the fact that no one else seems to address the core of the problems of today's generation, I identify with him completely. When he keeps having to repeat how filters are important, I know its because he is worried feeble minded people will portray him as being anti-filters or against the gedolim. To me, what Rav Weinberger says is common sense and brilliance mixed together. To others it might be a something new or a different approach. One remarkable thing he says is when he talks about the chosid who works in the diamond district on fifth avenue. He has filters on all his computers and smartphones, so hopefully no shmutz makes it through. But what about the world around him? Everyday, where he interacts with real humans and where his emotions are easily carried away, where are the filters for him than? Can we really ask midtown Manhattan to have rachmunus on us chareidim and they should all walk around filtered? Who is going to filter his secretary when she tells him she had a very hard day and would like to speak with him about it after work? The everyday examples are so numerous. Only an internal filter will provide the solution. Unfortunately we can't install yiras shamayim, as easily as we can install a piece of software and thats why we are losing the battle. What Is also of importance is how I found this shiur. I received a random email that said, “listen to this shiur he says what you've been trying to say”. Thats all good, but at the bottom of the email it said, please keep my email anonymous! It felt like I was in the black market looking for some illegal stuff. I wish this wasn't true but it is. I get many anonymous emails and mostly for good reason, but not any containing a shiur. Have we reached such an insane point that someone is embarrassed to email a shiur because it might not be the prevailing viewpoint right now? Unfortunately, this does match a lot of what I keep hearing from people in chinuch in very right wing schools. If they say anything different than the current system allows, they are frowned upon or worse, out of a job. I only got to meet Rav Weinberger once on a video project and in those few minutes I realized I was in the room with someone in touch with am yisroel. He seemed so busy with his private work, yet made me feel important enough to give me the time I needed. We also spoke very shortly about the yeshiva and Bais Yaakov system and he seemed to understand it quite well. I also read one article of Rabbi Weinberger's in the The Klal Perspectives Journal, and there too I was amazed how on target he was with todays generation. 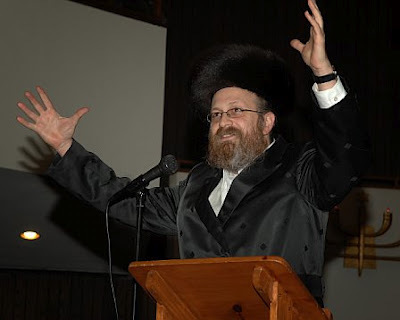 While everyone was screaming about the dangers of the Internet, he was addressing the real issues, and he made everything sound so obvious, I posted it on my blog at the time, Rabbi Moshe Weinberger: “Just One Thing is Missing: The Soul”. But what amazes me most about Rav Weinberger is that he openly says in this shiur how he doesn't use the internet. I believe when someone thinks straight using das-torah he doesn't need to use the internet to know filters are a bad choice. He is able to understand it based on the words of rav kook and a deep insight into the human psyche. He might not be the expert on how to navigate the internet but he sure is the expert on how to navigate the jewish soul. Thank you Rav Weinberger. I ask you to take the time and listen, you won't regret it . Evidently his congregants feel just like me. As stated on the website “This shiur is so important that we are making it available for free. Please tell all your friends!” Here is the link. Just click add to cart and download. The Short Long Way And The Long Short Way, Especially In A Filtered World. I would like to add my own thought. 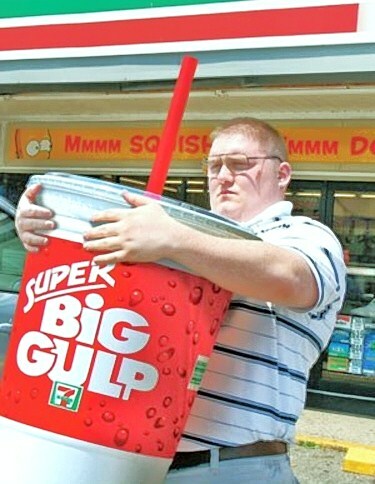 IMHO, Mayer Bloombergs recent proposal of not allowing the purchase of big soda, to me sounds like an outside filter, which wont really be a solution to the problem of obesity. 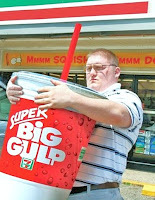 The obvious flaw is that one can purchase two soda's if one really wants. Working on oneself though, to diet properly would be an internal filter which would provide the proper solution, but more difficult to implement. In the same anonymous email I received another audio file titled Ger Katon, but the Rabbi was not Identified. I thought it was another great shiur and very powerful. I sent it to my friends before I was able to find out who the Rabbi was. It needs another post to highlight everything he speaks about, but it is definitely important to hear it. Here is a download to the shuir. A lesson from Frog and Toad on the futility of Internet filters without willpower! TheInternetShiur.com An Educational Website for the Millennial Generation. BAN THE ARTSCROLL IPAD: The Newest Technological Evil! I just want to tell you how glad I am that you have discovered Rabbi Weinberger. He is the rabbinic "rebel with a cause" that you have probably needed to connect with. He has personally told me about confrontations he's had with "big" roshei yeshiva about their failure to open up their hearts to non-conformist students who needed it the most. He sounds like Shlomo Z"L sometimes. I guess the Baal Shem Tov needs the real big hearted people to properly channel through to us. May there be more. Just wanted to share with you how proud I am of you. Your principled positions, your devotion to the youth at risk, your commitment to the State of Israel, and your refusal to be intimidated by those whose opinions are not backed by reason are traits to be admired. May you continue to have the strength and wisdom to continue the good fight. I remember hearing Rabbi Weinberger speak to a group of high school students at an NCSY Shabbaton years ago. It was being held at a hotel, and R' Weinberger was the main speaker after Friday night dinner. Unfortunately, the room was next door to another room with a party going on, complete with DJ. So R' Weinberger found himself competing with Madonna and her colleagues. More than a few kids thought this was pretty funny. There were some giggles, and some kids started singing along with the lyrics next door. The mood was about to be ruined. Said R' Weinberger, "To quote Paul Simon, a man hears what he wants to hear and disregards the rest. Na na na." The kids were floored (and us advisers were ROTFL). I could just hear what the kids must have been thinking. Here was this rabbi dude, complete with the beard and the furry hat and the long frock coat thingie, and he could quote Simon and Garfunkel! (This was when S&G was still hip.) He had those kids the rest of the evening. I've followed R' Weinberger's career from afar since then. He's one of the special ones - someone who has his hand on the pulse of the hamon am, speaks their language, then inspires them to grow. Kein yirbu. That reminds me of the great song "The ninth man on the team"
loved the shiur, and the message you and R' Weinberger have been trying to push. but it seems that the higher ups in the ultra-orthodox world were "meyaesh" on our generation, and all we can do is try to take the easy way out. There's an easy way out? I don't think so! I must be very naive. What do you mean? if you listen to R Weinberger's shiur, he notes the 2 ways to handle the internet issue. either teach kids how to learn to control themselves and only see and search for the good (and not want the bad), or just filter everything, which in theory is "easier" in certain ultra-ortho circles. prevent them from any tv, radio or computer, tell them they can't go outside of 13th ave ever, and keep them in the beis midrash. R Weinberger's (and R' Kook's) point is that the "easy way out" isn't really a way out, as it doesn't solve anything and in the end leads to failure, and we should try to have patience and create real solutions, even if they are harder to implement, as at least that can solve the problem. Great Summery. I think milhousetrabajo was speaking about Rabonim that gave up, not his own point of view. Great post! I was actually going to email you a post I put up when R Weinberger's shiur came out, but I didn't have your email address. Rav Weinberger is awesome! We don't live in Woodmere, but get there about once a year (and stay with the family of one of your staff from the girls division of your camp. You beautifully summarized R Weinberger's points. Thanks, I just read yours now. Sorry I didnt see it earlier or I would have linked to you in my article. I'm going to guess you stay by my former HC because I know they are big fans of Rav Weinberger. Yes. If you were at the chassuna after Simchas Torah the odds are we danced together (we were at your former HC's house for Simchas Torah). I have been teleconferencing and listing to R Weinberger for almost 20 years (and went to shiurim when I as single). He is a unique voice and his article in Klal Perspectives was a delight to read. Your point about him not touching a computer and the daas associated with that is brilliant. The way you present Rav Weinberger's position does not seem too honest. For example, do you think he would advocate one should not purchase flowers for his wife on erev shabbos? Absurd!!! His point clearly is that more focus should be placed on dealing with the source of the problem (one's soul). This is not to the exclusion of filters, rather in addition to filters. I fail to see how these are mutually exclusive. Though the values of personal autonomy abound, this does not discount the values of filters. Dovid, it is an amazingly deep message. something like the famous saying of chazal - "it's the mouse that is the "thief",not the hole". I've heard that when the printing press was introduced many great Rabbis were against it - because "now the yetzer hara can enter each persons home" - i haven't seen any proof that this was true - but if so - it is very telling. Thank you Dovid for posting this - I think it is a very important message. I did hear a tremendous respect for where the Gedolim are coming from and that the Asifa was a very important step, just that we can't leave it at that. Much of the cynicism and Asifa bashing that I saw before and afterward did not have that tone, but rather that of clueless, fear-mongering Gedolim who just want to keep controlling the Klal. The true Gadlus of the Gedolim is as R. Weinberger illustrated with his examples. Some may have more foresight, some less, but the people who are looked at as our Gedolim are the ones who have displayed and demonstrated to their followers and everyone else that their love for every member of Klal Yisrael is fierce. Indeed, it is up to us to inform them, not to question their motives and tune them out when they say things that don't resonate with our worldview. I feel more comfortable with the likes of Rav Weinberger and Rabbi Horowitz, drawing on their vast experience with leading kehillos and working with youth to question the best way of being effective at inspiring them, then the Hamon Am like myself and much of the Facebookophere that is only speaking from our own vantage point. Hatzlacha with inspiring your campers this Summer. R micha berger told me it's r moshe tuvia lieff, who's alsoo mentioned in one ofv the posts here. I pretty sure its not him.